There are a lot of neat tools people have built for DigitalOcean. The app I’m really in love with is DOSnapshot, and is hosted on GitHub. DOSnapshot does exactly what its name would suggest, it takes snapshots of your droplets. As of this post, I’m the only one that’s left a comment on the DOSnapshot Community Projects page, which took me a bit by surprise, given the quality of the tool. Taking a snapshot of a DigitalOcean Droplet is essentially like making an exact copy of the Droplet (server) that you can then use again at a later time. Very useful for scaling and updating a Droplet to a newer version of your Linux distribution without losing all of the Droplet’s configuration. Etel Sverdlov does a very good job of explaining the difference between snapshots and backups in this DigitalOcean community tutorial. I suggest you read it if you’re unsure what the differences between a backup and snapshot are. Pre-built binaries are also provided for Linux users, and OSX users have the option of installing via Homebrew Tap. Please remember that running the do_snapshot command will cause your droplet to shutdown so the snapshot can be taken. DOSnapshot has a pretty large number of options that you can specify. I’m going to keep this simple so you get the basics of it. Learning a few of the main options will be mostly what you need to know, after you’ve got them figured out, setting up a cronjob is cake. The above will take a snapshot of only one droplet, a droplet with an ID of 1111, replace 1111 with the ID of your droplet. You can find your droplets ID in your browser URL bar while managing the droplet. So if you see https://cloud.digitalocean.com/droplets/1234567, your droplet’s ID is 1234567. Here’s all of the options. If you have questions about setting any of this up, feel free to leave a comment! I love the GitHub explore today emails. It’s a daily email consisting of currently trending repositories, repositories starred by people you follow, and repositories that have been starred by GitHub staff members. The September 06, 2014 email included a repository that caught my eye, StylishThemes/GitHub-Dark. Apparently one of the people I follow on GitHub starred it, which is awesome. I may not have found this otherwise. Dark GitHub requires that you have the Stylish extension installed for your browser. Stylish can be easily installed in Google Chrome or Mozilla Firefox. So, before you go any further, make sure you have the Stylish extension installed. Click here for Stylish for Google Chrome, and click here for Stylish for Mozilla Firefox. Stylish is a very useful tool for changing the style of websites, they have an extensive repository of styles that you can apply to your favorite websites. As of this post, they have custom styles for 59,197 websites. Stylish is powered by userstyles.org. The Dark GitHub userstyle comes with a variety of syntax highlighting themes, the ability to set your own background image, setting a base color scheme, and changing the code tab size (defaults to 4). 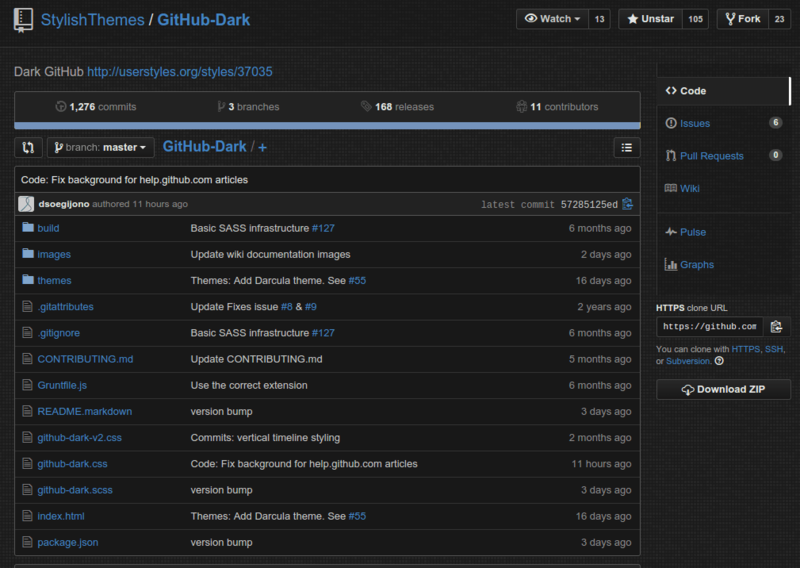 To install Dark GitHub, visit the GitHub-Dark userstyles.org page. Select your options (ie: syntax highlighting theme, background image, etc). I typically just leave everything at their defaults. Once you’ve got the options set how you want, click the green Install With Stylish button, as seen in the image above. You’ll be asked if you’re really sure that you want to proceed with installing the GitHub Dark userstyle. If you do want to install it, just click OK.